Using coins in games can be a great way not only to teach children about the value of money, but also to teach a number of valuable mathematical concepts including addition, subtraction, multiplication, and division. You can use regular coins, or if you have concerns about coins going into little mouths, you can make your own coins out of cardboard and write the values on them clearly for early readers. If you decide to use real coins, make sure your players know ahead of time that they will not be keeping the money. Kids learn best when they think they are playing a game. 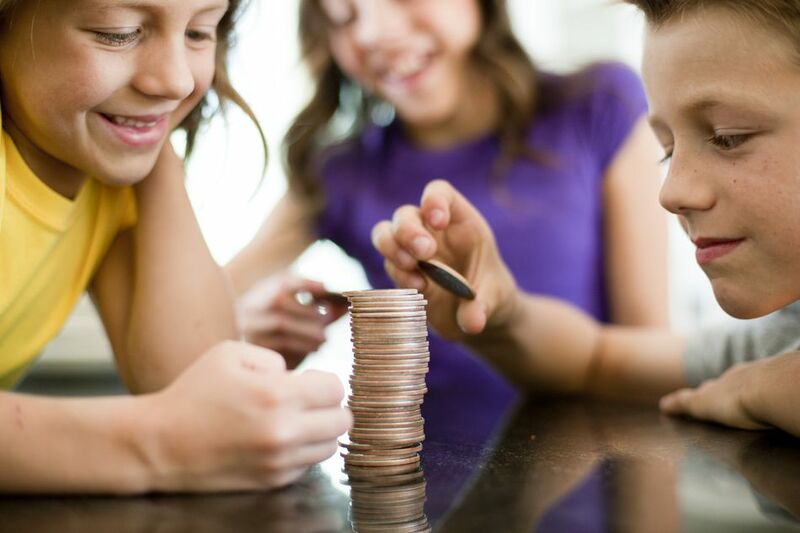 By turning coin-counting and math exercises into fun games that the whole family can play, kids can learn valuable information about money management without even realizing it. Below are several options. This variation of old-fashioned penny pitching has children tossing mixed coins into a bowl. Those that stay in the bowl become part of the winner's stash, while those that land outside the bowl ​go to the other player. At the end of the game, and you can set the time based on age and patience level, kids must count up their winnings to see who actually has the most. An important lesson: sometimes the largest number of coins does not add up to the greatest amount of money. Players take turns rolling the die and adding coins. The winner becomes the first player to reach exactly one dollar. If taking a coin would put the player over a dollar, the player loses the turn. Once the kids master the game, you can change the winning amount to odd amounts, like $2.17. The difficulty of this game can be varied depending on the child's needs. For young children who are learning to count but are not adding yet, keeping values small and just using pennies will be effective. For older children who can add, use higher values and all of the coins. Create a set of cards with different values, and give each child a starting bank of coins. For younger children, use card values up to 10 cents, and for older kids create card values up to a dollar. Players take turns drawing cards and then use the coins to create the value shown on their card. There are typically no winners in this game, but perhaps you can provide a small reward like a sticker every time a player gets the right answer if your children will enjoy it more. You can modify this game depending on children's ages and counting levels. Parents hide coins, real or pretend, around the house. Children are then set loose to find as many coins as they can. Pennies can be used for younger children and the rest of the coins can be added in for older kids. Keep track of how many coins you hide, and when all the coins have been found, players count up their totals. The player will the highest total wins the game. Kids will immediately want to take a turn hiding the coins; just make sure you are able to find them all. This game works well for younger kids who are learning to count. Gather a number of toys and place price tags on them, keeping the prices countable in pennies. Have the children identify the price and count out the number of coins they need to buy the item. But make sure players know they aren't playing to keep the items. Mix and match the items and give kids plenty of pennies so they can figure out the best way to divide up their pennies and spend them. Kids love to play money games, and it's a great way to help them learn while having fun.